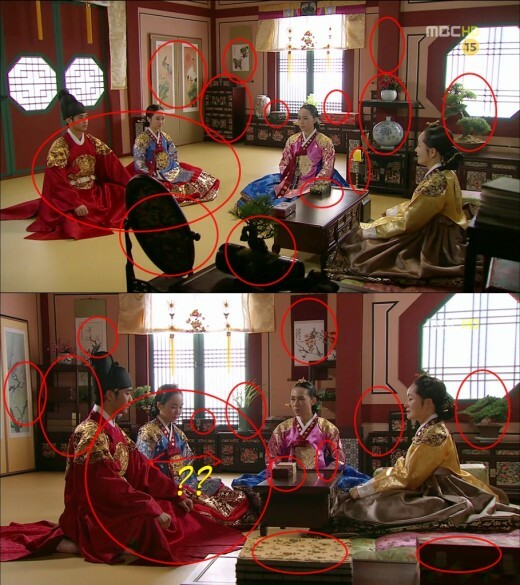 The “find the differences” photo of MBC drama The Moon that Embraces the Sun (The Sun and the Moon) was made public, receiving the attention of netizens. On January 20th, 2012, on an online community bulletin board, a set of photos with the title of “finding flaw on the scene” was published. The published photos are the screen capture of consecutive scenes broadcast in episode 6 of The Moon that Embraces the Sun broadcast on November 19th, 2012. The actor who acts the role of the king was changed to adult actor Kim Soo Hyun on the day, although after a long period, but he doesn’t forget Yeon Woo and doesn’t open his heart to others. But what’s worrying is the decorations of the grandmother dowager queen’s room. The photos published are the screenshots from the room. The ceramics, floor screens, mirrors and other props that appear in the first photo, are having differences on the two consecutive photos which are obviously in the same room. The props that supposedly at the location as indicated could no longer be found in the second photo. After seeing the photos, netizens said, “Miraculous scene, couldn’t be shot at different days?” “Thought that the erroneous props can’t be detected?” and so on.